A couple weeks ago I attended my cousin's bridal shower. Something really neat they did was to send out recipe cards with the invitations for you to share one of your favorite family recipes with the bride. This reminded me of the recipes my cousin Nicki included with her gift to me 14 years ago. Out of everything I received, these are what I seem to use the most. You see, your taste in table settings will change. Kitchen appliances with need replaces. You will, at some point, upgrade your cookware, but recipes last forever. So today, I am going to share one of those wonderful recipes that Nicki gave to me, and that Studhubs and absolutely love! Now, I have tweaked the original recipe over the years. So Nicki, if you are reading this...I'm sorry. However, I think it has only made a FANTASTIC recipe even better! To begin, you will want to grate your onion and garlic. Also, if you are not a fan of onions, you can replace the grated onions with onion powder. You get all of that great flavor without the onions themselves. Now, in a mixing bowl, combine the ground beef, onion, seasoning, egg, and bread crumbs. With your hands, mix everything together. Then, portion out four equal patties. Then, take your thumb and press into the middle of each one. This will help them from puffing up. In a skillet over medium/high heat, brown your patties on both sides. Remove the brown patties from the pan and set aside. Allow the onions to cook until soft and translucent. Once the onions are nice and soft, add the beef broth. combine the water and cornstarch together and mix well. This is what is called a slurry. It will help thicken the gravy while keeping that deep glossy brown color. Next, add the Worcestershire sauce. This gives the gravy a really deep flavor. Taste for seasoning. If you feel it needs any, add now. Your patties will be nice and juicy and the gravy with thicken. Serve with your favorite sides and sit back and watch your family DEVOUR it! 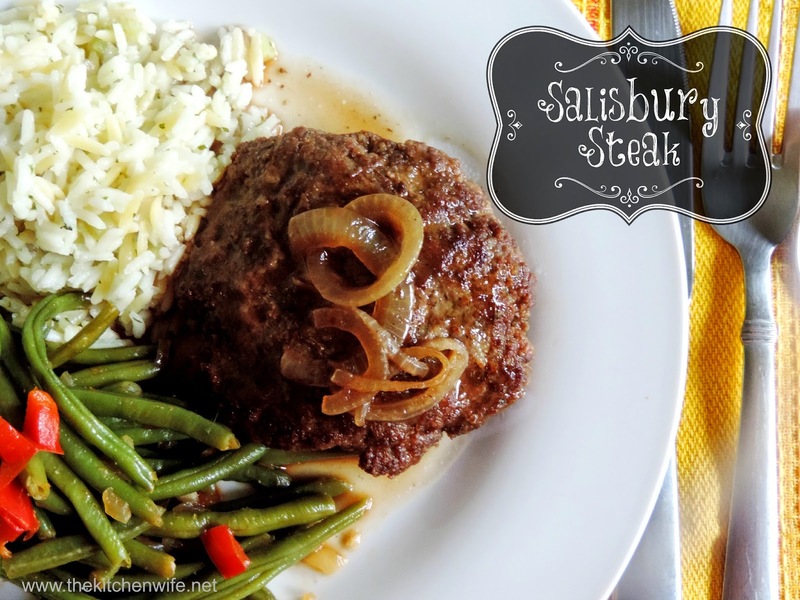 This is one of those meals that has the Sunday Supper feel with the week night meal timer! It is definitely a regular in this house! So, give this a try tonight and let me know how it goes on my FACEBOOK page! You can also pin this recipe on PINTEREST. In a mixing bowl, combine ground beef, egg, onion, garlic, seasoning, and breadcrumbs. Portion into 4 equal parts. Make patties and, using thumb, press a small well in the top. In a skillet over medium/high heat, brown both sides of the patties for 2-3 minutes. Add beef broth to the skillet and bring to simmer. Combine water and cornstarch and mix together. Return patties to the pan. * If you do not like onions, you can omit the onions and use onion powder. ** If you do not like onions, you can omit the onions.